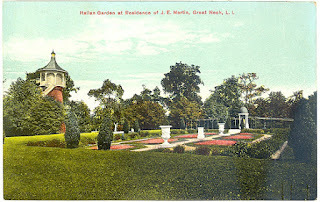 The Italian Garden at 'Martin Hall', the James E. Martin estate designed by Little & O'Connor c. 1900 in Great Neck. Click HERE and HERE for more on 'Martin Hall' which has since been demolished. I know many on this site feel the original Martin Hall garish and gaudy....but I love the feel of the original home. I guess I'm a true Victorian at heart, because I'd take the original stairs and main hall over the latter.